An Aussie icon since the 1920s! Passiona is a sweet, refreshing soft drink with a delightful passion fruit flavour. Carbonated Water, Sugar, Passionfruit Juice, Food Acids (E330, E331), Flavours, Preservatives (E211, E202), Colours (E102, E110). 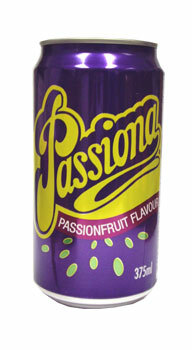 Passiona is like the taste of aussie childhood in a can. The gorgeous passionate fruit flavour is refreshing, delicious and beings forth memories of running around barefoot in the backyard before diving into the pool or running back to the shade of the BBQ shelter to escape the sun at the beach on a Sunday afternoon.